It was an idea born of its time. The early 1920s were lively years, when it was simply good to be alive. So many were not. A whole generation of young European and Dominion manhood had perished in the First World War. It was the age of the flapper and the Charleston, a time when chivalry was reborn in the almost conscious effort to banish the painful memories of conflict. Among those most concerned to restore faith in the value of international friendships and the essential goodness of man was Arthur Wallis Myers, the respected lawn tennis correspondent of The Daily Telegraph and the lawn tennis editor of The Field magazine. Wallis Myers (he was never called Arthur) had been a good tennis player before the war, steady but unspectacular, and with a keen appreciation of the finer points of strategy, especially in doubles. In addition to his interest in tennis, Myers was a respectable golfer and in 1913 instituted the Lawn Tennis Golf Cup, a competition for all past and present tennis players, which survives to this day as the Desborough Cup. When war broke out Myers was 36, too old for active duty. Nevertheless he spent a productive war. His wide knowledge of Europe was useful to the National War Aims Committee on which he served from 1917 until the end of the war. In 1918, he was seconded to the staff in Downing Street for two years. 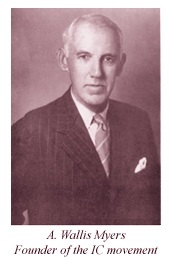 For his important contribution to the nation's affairs Wallis Myers was awarded the C.B.E. 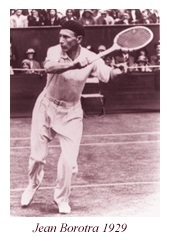 The post-war period at Wimbledon saw a sudden surge in interest as a flood of new overseas stars appeared. It was during this period that an idea began to crystallise in the mind of Wallis Myers. 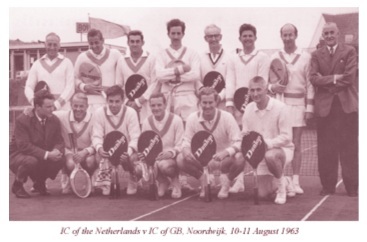 According to the recollection of the late Ted Tinling, the idea had developed out of earnest conversations between Myers and Dwight Davis, the donor of the Davis Cup. Surely, thought Myers, there should be some way of nurturing and preserving the camaraderie that existed between the young gladiators of so many countries who met in serious but friendly rivalry at tournaments around the world each year. Another who influenced him in this direction was Lord Balfour, the former Prime Minister (1902-1905). So it was that early in November 1924 Myers finally put physical expression to his idea. A fortnight before the inaugural meeting, he sent out letters to some 50 British players who had crossed the seas as members of touring teams. All that were in London at the time attended a gathering over which Sir Leonard Lyle presided. This was an historic occasion. To an attentive and sympathetic gathering Myers explained his ideals: "We are in some measure compensated for the temporary loss of supremacy on the courts by the reflection that our early pioneers, through their skill and enthusiasm, had sowed the good seed abroad. We are seeking to cement the ties that bind us to all international players, to exchange greetings with them from time to time, to offer them hospitality when they come in our midst. Hands across the net, in fact, means hands across the ocean." Myers had his audi ence enraptured. They had all experienced hospitality abroad and were fully in tune with his sentiments as he continued: "The I.C. will compete with no other club. It will pay fealty to constitutional authority and will not seek to usurp or overlap the functions of other organisations. We should, in principle and in spirit, be a society of players who have toured in and been educated by overseas countries, co-operating in the course of time with offshoots of the parent, which might be founded abroad for the same object. Our purposes are social, nonpolitical, of a masonic nature." It was considered a great honour to be invited to wear the distinctive grey tie with the single pink stripe. But, as Myers recalled, not every player who had carried his racket abroad automatically became a member. Steadily our panel was enlarged so that by 1932 th ere were 107 ordinary and 55 honorary members. Election did not necessarily follow qualification; the deed was of more value than the word. The first overseas nation to form an International Club was France. It was launched at a meeting held in July 1929 at the Automobile Club of France in Paris. There were two pink stripes on their new tie. It was natural that the Americans should decide to launch their own I.C the following year and appropriate that they should choose to have three narrow stripes on their steel grey ties. Wallis Myers died on the eve of Wimbledon in 1939 after being taken ill whilst returning from Britain's losing Davis Cup tie against Germany in Berlin. Accordingly he was not present to witness the strong revival of the I.C. movement after the war. The arrival of open tennis in 1968, far from dimming the enthusiasm of prospective newcomers to the I.C. fold, served to accelerate interest. The game itself was growing fast and much of it was increasingly commercial. Yet there seemed to be the recognition among those responsible for directing its course in so many countries that the finest traditions needed to be actively promoted lest they were swept away on the rising tide of professionalism. The foe that comes with fearless eyes. That binds the brave of all the earth."